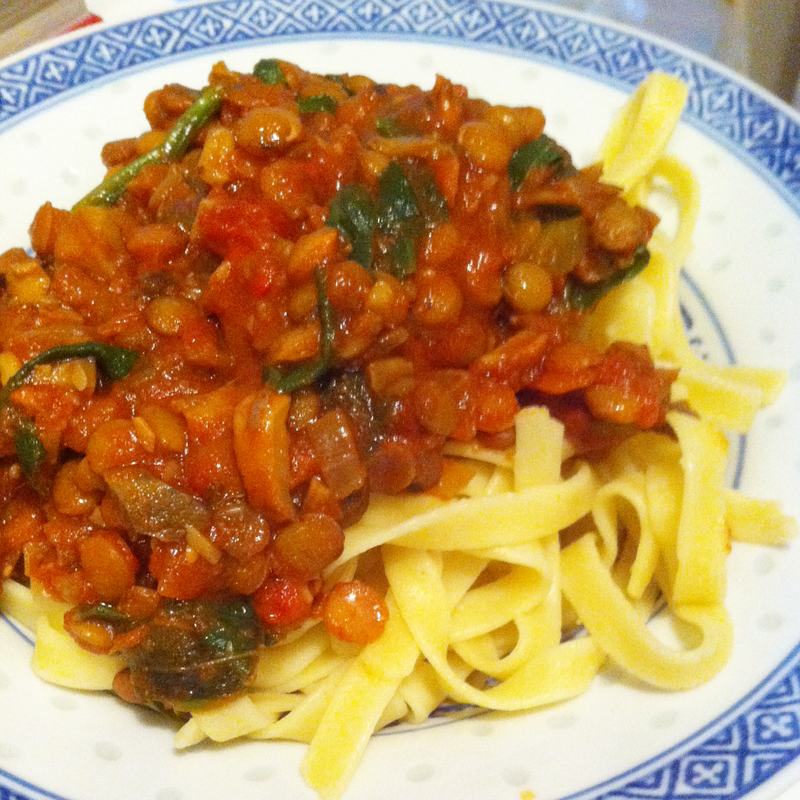 last saturday i had my very first visit to little deer tracks in coburg, where i had an amazing lentil ragu over linguine and obsessed about it all week, until finally i cracked and on friday attempted one of my own. it was delicious, we finished nearly all of it and i was so sad when i ran out of pasta. it filled the house with beautiful, rich aromas and filled my mouth with tastiness and my belly with warmth, i recommend you make this immediately as we now, finally, appear to be commencing our descent into a melbourne winter. soak the lentils in some hot water while you chop your veggies. in some olive oil, brown the onion, then add the celery and carrot with the mushroom. allow to fry until the mushroom starts to release its juices, then add the garlic and the chilli and fry through for a minute or two. drain the lentils and add these and the tomato to the pot. simmer for a few minutes before adding the basil, bay and oregano, as well as the stock. bring to a boil and reduce to a simmer, and leave simmering, half covered, for as long as it takes for the lentils to cook through. the longer the better - i simmered for about an hour. top up with stock or wine as appropriate, if necessary. cook the pasta as appropriate and serve together. i also shredded a small handful of baby spinach leaves and added them in right at the end. if i'd had some some red wine i would have added a splash or five at the beginning to bring out a rich flavour, but it was totally fine and rich without. will make this again almost immediately. i'd love to try this as a lasagne sauce. you can barely tell there are mushrooms in it if you chop them finely enough.